New Antonov An-178 short-range medium-airlift aircraft has completed tests of loading and unloading light wheeled self-propelled vehicles. 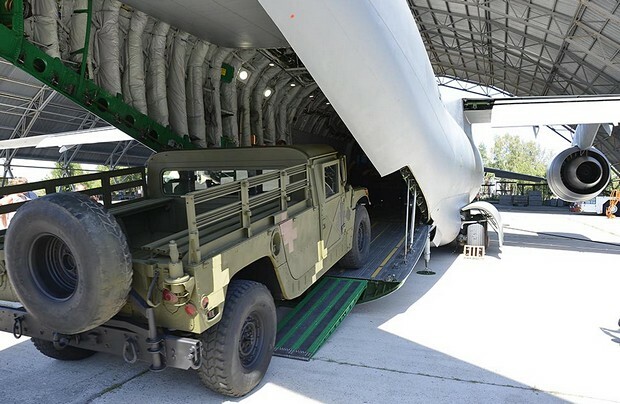 The trials, part of the ground tests program, were performed in August using three High Mobility Multipurpose Wheeled Vehicle (HMMWV) М1097А2, the Ukrainian company said in a statement. The tests confirmed the design projections for driving a vehicle in and out the airplane, its placement and lashing inside the cargo bay. Tests for loading and unloading of container and pallet cargo are also in the plans. “At present, certification tests of the An-178 are one of the main objectives for our company. We have firm orders for delivery of 10 such airplanes to airlines in Azerbaijan. Antonov plant has started preparation for the aircraft’s serial production,” said Oleksandr Kotsuba, president of Antonov. Meanwhile the test team is preparing the aircraft to continue flight test program. To date the An-178 has performed over 100 test flights with an overall duration of 160 hours. All the procedures are in line with European Aviation Safety Agency’s CS-25 Large Aeroplanes requirements, according to Kotsuba. An-178 program being developed by Ukraine’s Antonov state aircraft manufacturing enterprise is based on An-158 passenger airliner. Powered by two D-436-148FM engines, An-178 is set to replace outdated Soviet-built air-lifters such as An-12, An-26 and An-32. The first An-178 prototype was rolled out in April 2015. It has a maximum payload capacity of 18 tons. Antonov estimates that the demand for the An-178 will reach 200 aircraft by 2032. Its launch customer is Azerbaijan cargo carrier Silk Way Airlines, which signed a LOI for 10 aircraft. A similar letter of intent for 30 aircraft was signed in December 2015 with a Saudi Arabian customer.